What is the different between chess table and chess board? A chess table is a table built with features to make it useful for playing the game of chess. And chess board is a board for chess game but it folded and you can save it at your cupboard or on the table. Both of them consists of 64 squares (eight rows and eight columns) arranged in two alternating colors (light and dark). The colors are commonly also called "black" and "white" (or "light" and "dark"). The wooden chess table is suitable for outdoor decoration, especially in your garden and patio. Although it is made of wood, it is fine to combine it with steel chairs. It delivers the look of vintage and modern. Very sophisticated! The dark color chess table is made of solid Teak wood to give a natural feel. When it is not functioned as its nature as chess table, it can be used as common furniture table. 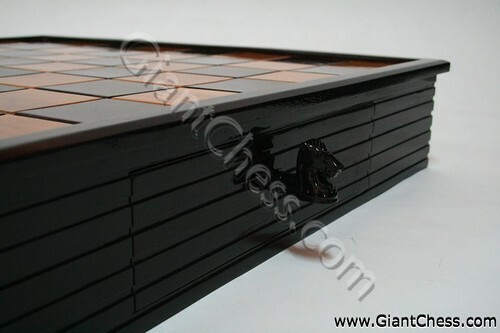 It has two storage drawer in its two sides to keep the chess pieces.